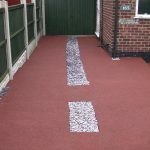 resin driveway access covers – to cover or not to cover? 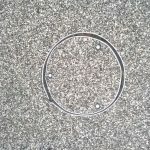 The paving expert website explains in great detail the difference between access and inspection chambers. Either way these are an important part of your garden, driveway, path or patio and should be dealt with carefully. 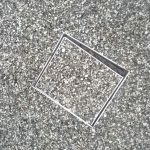 The idea of a tray is that it can be filled with the product of use – resin – concrete – block paving -tarmac – grass and will blend in seamlessly. This can be in your garden, driveway, path or patio. This tray allows access easily and clearly and is surely an advantage to any homeowner. If you look carefully (that is the idea as well for it to be less obvious) you can see the covers but these resin driveway access covers blend in well. You would think in this day and age more records would be online and readily retained for utilities such as electricity gas and water. A clear mapping system can help any homeowner, driveway company, builder and service provider for example. An indicator of where to or not to work. Where to dig out or knockout or not to dig out or knock out. It is important to get the positioning right though as you need the access or manhole cover to sit flush unlike this examples we have recently seen. Call us now 01623 623986. We are based in Mansfield . No sales men. Contact Simon or Faith and have a chat if you need advice for your driveway path or patio works. From where we are based in the East Midlands (the Derbyshire and Nottinghamshire border) we can resurface your driveway, path or patio. 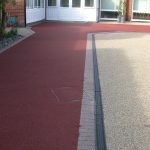 Providing you with a weed free alternative to the usual block paving, imprinted concrete, tarmac, and concrete options. Beeston, Bolsover, Clowne, Edwinstowe, Gedling, Kirkby in Ashfield, Loughborough Matlock, Newthorpe, Old Whittington, Radcliffe on Trent, Sheffield, Walesby or Wollaton. 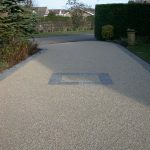 This entry was posted on Sunday, December 2nd, 2018 at 10:21 am	and is filed under Concrete, Diary of a Mansfield Resin Driveway Company, Driveways, gardens, Imprinted Concrete, Latest News, Mansfield, Paths, Patios, Tarmac and Asphalt. You can follow any responses to this entry through the RSS 2.0 feed. Both comments and pings are currently closed.